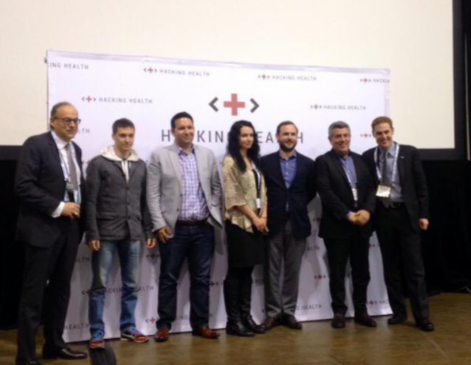 CareKit was created during the 2015 eHealth conference in Toronto for the Hacking Health Design Challenge. This comprehensive software and hardware solution enables monitoring and management in real time of at home patients with the use of wearables and sensors. Eight months later, Reliq Health acquired CareKit (rebranded iUGO Care) for $2 million in shares and performance warrants. Co-founders Leo Godreault and Giancarlo De Lio gave us some insight on their incredible journey. “Leo initiated the project” explains Giancarlo. “We met before the challenge in a coffee shop, he told me about his idea, and he convinced me to come onboard”. Hacking Health Design Challenge focused on themes such as patient management, patient coordination and communication so their team developed CareKit, a care coordination platform connected to wearables and Estimote Beacon sensors linked to Apple’s HealthKit. The data generated by patients while at home is shared with healthcare professionals and family members, allowing them to monitor their health remotely. Leo and Giancarlo benefited from the strengths of well-rounded team with the right skill set and talents to succeed. Giancarlo is an accomplished entrepreneur with a background in healthcare IT who had previously sat on the jury for the 2014 eHealth Hacking Health Hackathon while Leo is a trained nurse who had also participated in the Apps For Health challenge. CareKit won both Most Innovative Solution and Microsoft Digital Health Awards and the Microsoft Digital Health Awards – Giancarlo says that developing and refining both hardware and software was one of the added value of their project. The high quality of the final demo presented by Leo ensured their success at the competition. They both acknowledge that the Hacking Health Design Challenge was the drive behind iUGO Care. The eight week format of the design challenge facilitated prototype development and «the creation of something truly functional». Additionally they were able to understand the needs of the Ontario Telemedicine Network (OTN), an important leader in the field, and meet the right people. During the meetups organised by Hacking Health, they had the opportunity to discuss with mentors who stirred them towards the right direction. For instance, Leo explained that it was a suggestion from industry leaders that prompted them to consider a feature to monitor patients remotely. Giancarlo named Dave Greenwood as one of the leaders that saw the potential of their project and supported them during the various steps of the challenge. The fact that OTN supported iUGO Care even after the competition encouraged them to keep on going with their project. scale forward. Leo, who at the time was working as a nurse, took a leap of faith and decided to focus on iUGO Care with Giancarlo full time. What would he recommend to future participants that could be faced with a similar dilemma? “It’s very difficult, I would say that it has to be a project that is really meaningful to them. It has to be a risk that they are willing to take”. managing their care plans with a system of alerts and teaching modules. To celebrate iUGO Care’s first anniversary, Leo and Giancarlo will mentor and judge during the next Hacking Health Design Challenge at the eHealth conference. They both continue to work hard on the development of their application and to create their own proprietary hardware while carefully following the result of the pilots. We congratulate them for their dedication and hard work!